The network of sacred groves have an important ecological function - preserving the flow of water in the Kaveri river, and conserving the ecosystem services on the plateau. The Ayyappa temple at the Echuru Sacred Grove. The deity inside the sacred grove at Hathur in Kodagu district, on the national highway connecting Mysuru in Karnataka to Kannur in Kerala, sits near a dangerous bend on the busy road. She is known as Vana Bhadrakali. Many travelling in vehicles that have met with accidents at the curve are believed to have escaped miraculously because of her guardianship. She is also known as Vahana Bhadrakali. “The goddess protects everybody who passes on this road in front of the grove. I am 50 years old, and have never seen a fatality due to accidents here,” said KN Vinu Vishwanath, president of the Vana Bhadrakali temple committee and a lawyer by profession. The divine strength of the goddess, he says, is because of the strict conservation of the grove that the families that live in the surrounding areas practise. The families living closeby have other benefits also. “There are 10 to 15 Kodava and non-Kodava extended families in Hathur and the nearby Kolatodu-Bygodu areas, which protect three such groves. As a result, there is water in our wells and also in our streams,” he noted. Like in other forests, the temperature inside the grove, where old, tall mango and black dammar (Canarium strictum) trees grow, and bonnet macaques and jungle fowls perch on the branches, is lower than the ambient outside. Hathur Vana Bhadrakali’s abode, the 16.5-acre sacred grove, is one among 1214 such patches in Kodagu, which is among the largest such network in the country. These groves in Kodagu are designated as protected forests under the Indian Forest Act. However, that does not mean that all of them are models of conservation. 3D imagery of the Vana Bhadrakali sacred grove. Kodagu is known for being the land from where the river Kaveri is born. Though Talakaveri is the origin, there are hundreds of streams flowing east that join to form this river before it leaves the district. Lesser known, there are parts of the district that slope westward, from where streams join and become the Barrapole river, which drops steeply down the edge of the Western Ghats into Kerala. The drought of 2016-17 adversely affected even this home of rivers. While the coffee plants standing under native or silver oak trees still maintain their greenery, the paddy fields in the valley are consistently dry across the district. Without enough water flowing down the streams into Kaveri and into the Krishna Raja Sagar (KRS) dam reservoir, there were riots in September 2016 over sharing of the river water between Karnataka and Tamil Nadu. According to the Karnataka State Natural Disaster Monitoring Centre, currently the storage in KRS is just 5% of its capacity of 45.05 thousand million cubic feet (TMCft). As Kodagu, like other parts of the country, awaits the southwest monsoon of 2017, there is an appreciation of the ecosystem services in many of the sacred groves. “In the recent years our efforts to conserve our sacred grove became stronger,” observed 66-year old KM Rajappa, president of the Kuttichatha Sacred grove Committee in Kirgoor village. The boundary of the 16.25 acre sacred grove has remained intact since the time of his childhood, he reminisced. However, though the conservation efforts had flagged in between, the erratic rainfall in the recent years got the seven extended families that take care of the grove to strengthen their efforts. 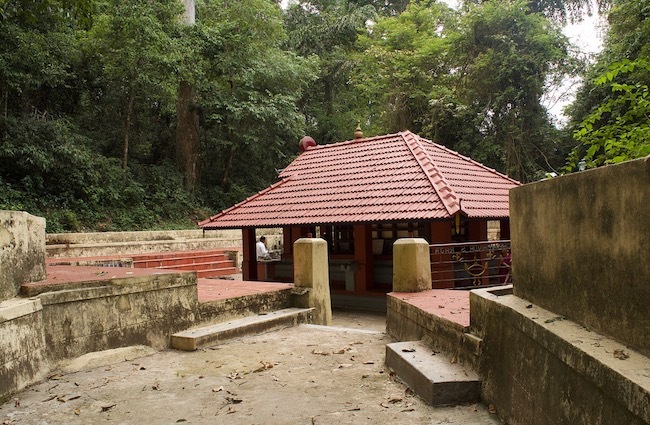 The sacred grove in Kirugoor is dedicated to Kuttichatha and Ayiram-billa Ayyappa (Ayyappa of a thousand arrows). 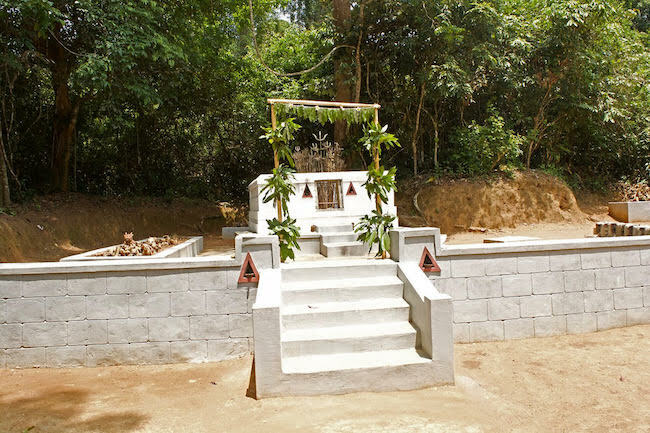 The Ayiram-Billa Ayyappa deity inside the Kuttichatha Sacred Grove. In the evening, Rajappa was presiding over the annual festival to the deities. The members from the seven extended families were in attendance as the oracle went into a trance and blessed them for a good year. The oracle spoke in Malayalam. Every year the oracle and his assistants come from the plains of Kerala, linking Kodagu with the sacred grove tradition of Kannur district. 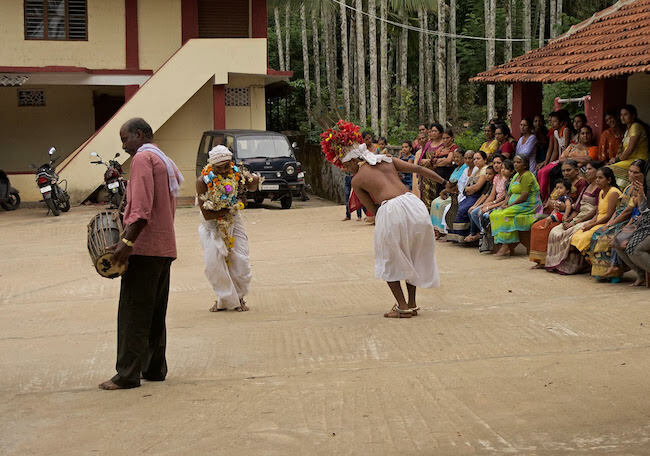 The oracle’s assistants dance outside the Kuttichatha Sacred Grove. “The gods in the sacred groves of the southern part of Kodagu have come from Kerala,” said CG Kushalappa, professor and incharge dean at the College of Forestry at Ponnampet in Kodagu. In other parts of the district the gods were brought from the adjoining plains. According to him, paleo-botanical studies using pollen gathered from the soil in the sacred groves show that the gods were brought into the sacred groves of Kodagu 350 to 400 years ago. It was a period of demographic change in Kodagu, with communities coming in from different parts to the plateau district. Before that the groves would have had animistic gods. One of the other sacred groves that the Kolatodu-Bygodu group of families conserve includes the Ayyappa-Subramanya sacred grove. According to a paper on the existence value of the Kodagu sacred groves by MG Chandrakanth, currently the director of the Institute of Social and Economic Change, Bengaluru, this is the oldest sacred grove in Kodagu, dating back to 1,000 BC. The grove has two menhirs (single, columnar stones) that are 12 and 10 feet tall. Even though they signify Ayyappa and Subramanya today, they may have represented animistic gods before, or could have been hero stones. 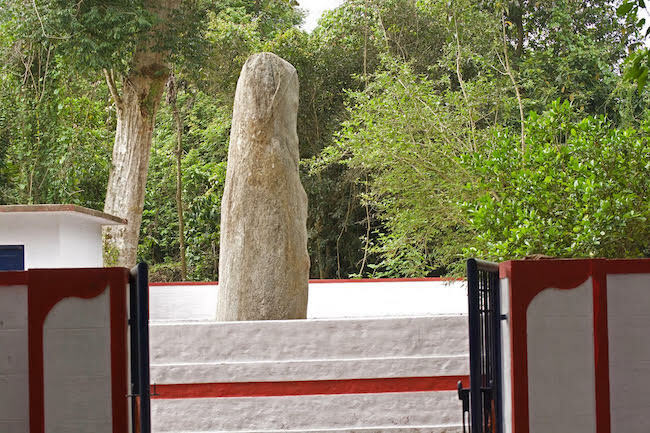 One of the menhirs at the Kolatodu-Bygodu Sacred Forest. Kushalappa also articulates his fears about the trend in recent years to increase ritualism in these places of worship. The typical sacred grove has worship only on the day of the annual festival. However, with an increasing trend towards Sanskritisation, some of the temples are starting daily worship practices. “Our sacred groves are essentially forest temples. They should not become temple forests,” he commented. Daily worship will mean increasing footfalls into the groves, which in turn would mean greater ecological stress for these fragile systems. Kodagu district has an average elevation of 800 to 1,000 metres above sea level, and the ridges can rise to around 1,500 metres. The rainfall in the district can vary from 2,000 mm per year to more than 4,000 mm. The network of 1214 sacred groves covers all vegetation types, according to BN Satish, assistant professor at the College of Forestry, Ponnampet. “While a majority of the sacred groves are of the semi-evergreen type, there are also tropical evergreen and deciduous forests,” he said. While the Kuttichatha sacred grove in Kirugoor is of the semi-evergreen type, not very far away from it, the Ayyappa sacred grove in Echuru is of tropical evergreen type. “This is a rather unique sacred grove,” explained Satish while walking into the Echuru grove. He kicks the carpet of fallen dry leaves carefully as he walks, for he had nearly stepped on a well-camouflaged Russell’s viper during his last visit. The Vana Bhadrakali temple at Hathur. From the year 2000 onwards the College of Forestry team has been trying to understand through research the conservation relevance and significance of the sacred groves as they complement the larger forests. Kodagu is a unique theatre for understanding the relationship. It has three wildlife sanctuaries (Talakaveri, Brahmagiri and Pushpagiri) and one national park (the Nagarhole National Park which is officially known as the Rajiv Gandhi National Park), and many reserve forests. The network of 1214 sacred groves adds to these larger tracts. “Internationally, the big debate in forestry is whether it is the single large or several small (SLOSS) forests that are better for conservation. In Kodagu we have a combination of both. Each village has at least one sacred grove. Thus it is the entire landscape that must be taken for conservation,” said Kushalappa. Even though there are encroachments and destructions in many sacred groves, in Kodagu such forest patches have not faced the drastic destruction as in other parts of the country is partially because of the janma land tenure system, according to Chandrakanth. This ensures joint ownership of land by an extended family and prevents its alienation outside its members. Decisions related to land have to be taken jointly by all members of the family. Interestingly, Chandrakanth’s study on existence valuation of sacred groves in Kodagu showed that the communities were willing to pay an economic price for the protection of not just their sacred grove, but also of the one in another village. Almost all of the people he had interviewed for the study (96%) said that they went into a sacred grove to seek divine blessings. The festivals in the forests also serve as social gatherings, since meeting family members was the next most important reason mentioned for visiting a sacred grove. 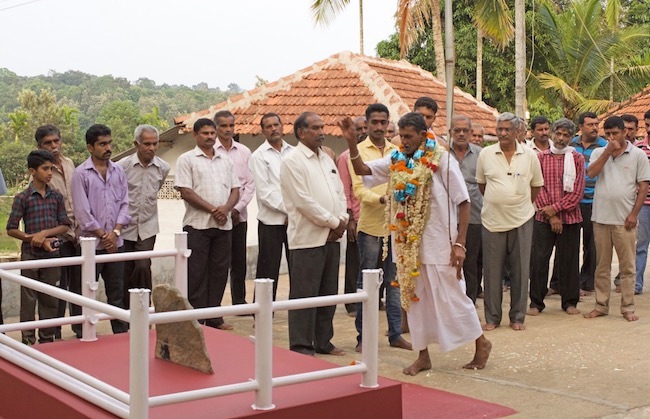 The oracle blesses Rajappa and other family members outside the Kuttichatha Sacred Grove. What the residents living near to sacred groves rarely appreciate is the pollination services that the sacred groves through the bees that live in the forests. Coffee plantations are the economic mainstay in Kodagu, and most of the farmers grow coffee on their lands. With 1,214 sacred groves, no coffee plantation is very far from their pollination services. The pollination service they get from the bees from the groves are significant. According to a combined study by ETH Zurich in Switzerland and the College of Forestry, Ponnampet, the giant Asian honeybee Apis dorsata, which nests in larger, older trees of the forests, is the main pollinator for robusta coffee. Pollination by bees increases fruit production by 50% over what is pollinated by wind. Walking through the 12.31-acre Mahalakshmi Sacred grove in Kannangala village, forest researcher SH Basavarajappa points to trees from Schefflera genus that are good forage species for bees. “When the sacred groves are conserved the bees are there. They help with the pollination of coffee and paddy. Without them there would be blossom but we will not have much coffee,” said CK Pooviah, member of Mayamudi Grama Panchayat. Pooviah, along with other members of his community are fighting to protect what is remaining of the Manil Ayyappa Sacred Forest at Balaji village near Gonikoppa town. The sacred grove, which was once 61.76 acres is now hardly five acres. Migrants from outside the districts who have built their houses on it have encroached upon the drier lands sloping into the swamp of the river. A small temple and a few trees remain around the swamp, as a reminder of what once was a good forest patch. The remainder have been swallowed by a shanty town. 3D imagery of the Manil Ayyappa sacred grove. “In my childhood I remember going into the forest for annual festival in the temple,” said S.B. Ramesh, president of the Manil Ayyappa Temple Committee. The temple remains and the oracle who had come from Kerala walked to it in a trance this year. But he was hardly walking through a forest. The members of the extended families that were custodians of this sacred grove and those who had encroached on it, watched the oracle walk around the temple, sword in hand. Ramesh says that the family members have been fighting a case for a long time to get the encroachments removed. Their success has been that they have obtained a stay to prevent further governmental development activities such as building of roads inside the encroached land. The land, which is designated for a sacred grove is a protected forest under the Indian Forest Act, and cannot be alienated for any other purpose, he argues. But they have not been able to make progress in the case. “We will fight to get back the forest land,” said Pooviah. But despite his and his group’s determination the sacred grove may never return even if they manage to reclaim the land. That is the fragility of the sacred groves that dot the Kodagu landscape. They are good as long as they are conserved. Once their destruction crosses an ecological threshold, it is almost possible to get back these vestigial forest patches. Unlike other parts of the country, Kodagu has had two factors favouring the conservation of its sacred groves. The fact that the groves are recognised as protected forests gives them legal protection. The janma land tenure system also provides protection. Ironically, the janma system is causing the destruction of diverse old trees in the coffee plantations. Traditionally, coffee was grown in the shade of forest trees, where the farmer had the right to the land but not to the trees. Over the years many farmers have let the native trees die and replaced them with silver oak, an exotic tree with its straight trunk which is good for supporting pepper vines. With the diversity of native trees decreasing in coffee farms there have been efforts to support those who conserve them to get payment for ecosystem services. However, despite these efforts, currently intact patches of forests in the interior of the Kodagu plateau are in the sacred groves. The larger tracts of contiguous forests are mostly along the western crest and the southeastern slopes of the plateau. Thus, the network of sacred groves in Kodagu have an important ecological function. It is not only for preserving the flow of water in the Kaveri river, but also for conserving the ecosystem services on the plateau. All pictures by S. Gopikrishna Warrier.